Besan Ka Halwa is a delectable dessert that comes loaded with dry fruit and a generous helping of desi ghee. 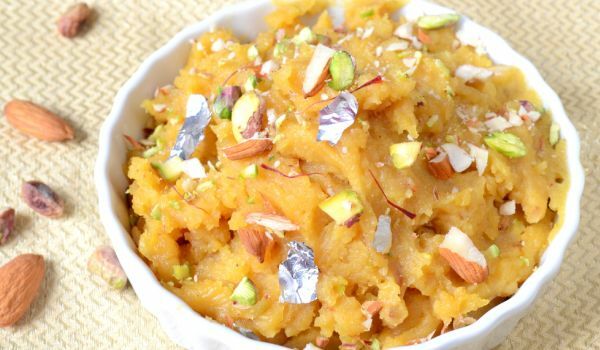 Learn how to make/prepare Besan Ka Halwa by following this easy recipe. In a non-stick pan, roast the gram flour on low heat for 10 minutes. Stir the gram flour and add sugar to it and stir for another 10 minutes. Pour the ghee and mix well and cook for five minutes. Add milk, mix well and cook till you get a halwa consistency. Add raisins, cashewnuts and almond slivers and mix well. Serve hot garnished with the almond slivers.